Cortana is the robotic Windows 10 digital assistant. Click or tap in the box on the left side of the taskbar. 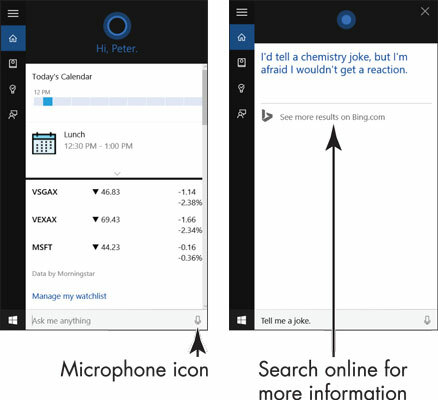 As soon as you click or tap, a “digital assistant” called Cortana springs to life, as shown here, left. Cortana can respond to questions you ask with your voice. To start using Cortana for the first time, select the I’m In! button, read the privacy statement that appears, and select the I Agree button (or select No Thanks if you change your mind about using Cortana). Then follow the onscreen instructions for setting up Cortana. To use Cortana, your computer’s microphone must be up and running. As you say these words, they appear in the text box, and if all goes right, Cortana recites a joke. As well, the words of the joke appear on the screen, as shown in the figure, right. Instead of selecting the Microphone icon to alert Cortana that you want to ask a question, you can say the words “Hey, Cortana.” Cortana gives you the weather in Chicago. Ask questsions of Cortana while the word Listening appears in the box. Seeing this word tells you that Cortana is prepared to field a question. In this instance, Cortana can’t answer directly, so your browser opens to the Bing search engine, as shown here. The question “Where is California?” has been entered in the Search box, and the results of the search point to information about California. 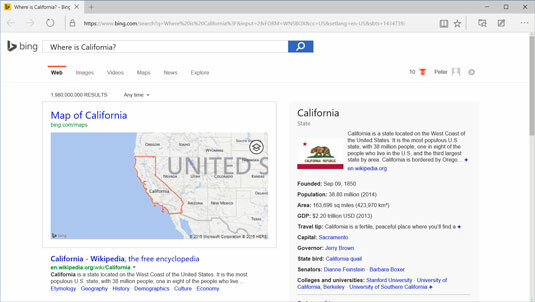 Regardless of whether Cortana can answer a question, you can always select the Search More Results on Bing.com link in Cortana to open your browser to the Bing website and conduct a search there. Return to Cortana and scroll down the screen by dragging the scrollbar or swiping downward. On the basis of questions you’ve asked, Cortana provides newspaper articles and other information that it thinks are of interest to you. You can click or tap an article to open it on your browser. Cortana can remind you to attend events and appointments. As shown in the following figure, left, Cortana presents a reminder screen. 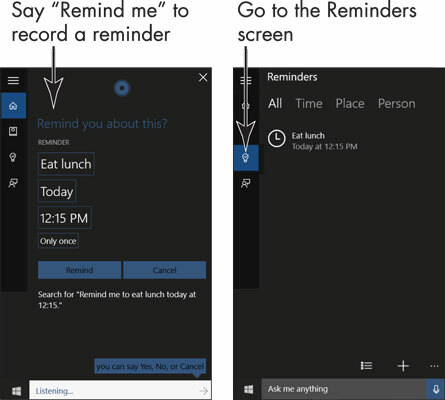 As long as you begin by saying “Remind me,” Cortana can record reminders like this. Say “Yes” or select the Remind button. On the App bar, select the Reminders button (the light bulb) to go to the Reminders screen, as shown in the figure, right. You see the reminder to go to lunch. If you change your mind about using Cortana, select the Settings button. On the Settings screen, turn Cortana off.